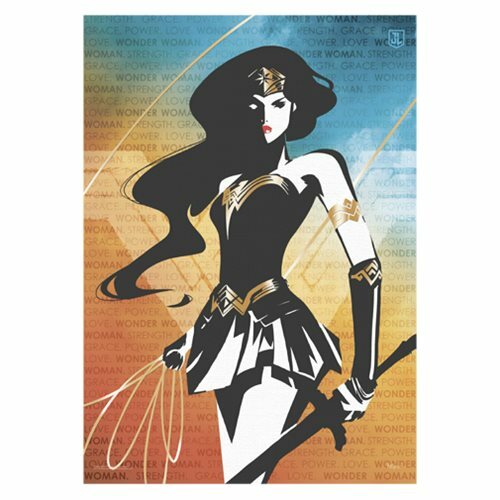 This unframed 24-inch tall x 17-inch wide Justice League Wonder Woman Words Strength MightyPrint Wall Art features Wonder Woman like you've never seen her before! The minimalistic style of art and coloring emphasizes the gold of her armor, tiara, and lasso, while her dark flowing hair and sword are given a dramatic, dark silhouette. In the background of red, gold, and blue are just a few of the words that can be used to describe the amazing Amazon warrior: "Love," "Power," "Grace," and "Strength."